The original Gold Jiffy padded bag. 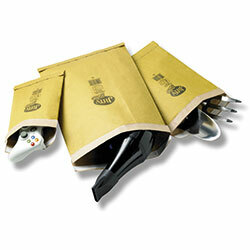 Wholesale Jiffy Bags to be used for heavy duty protection of items sent through the postal system. The original gold Jiffy padded bag. For heavy duty protection. PB1 size is ideal for A5 size items, DVDs, video games etc. PB2 size is ideal for multiple DVDs, video games etc. PB3 size is ideal for books etc. PB00 size is ideal for A6 items, memory sticks etc. PB6 size is ideal for clothing, oversized A4 items etc. PB0 size is ideal for a single CD etc. PB4 size is ideal for A4 size items, brochures etc. PB7 size is ideal for A3 size items, files and ringbinders etc. PB5 size is ideal for large books etc. PB8 size is ideal for A3+ size items, computer peripherals etc.